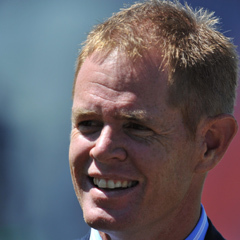 Auckland - Former South African great Shaun Pollock on Friday predicted the Proteas would win a first Cricket World Cup by beating Australia in the final, helping to make-up for his own personal setbacks against the four-time champions. "If you want to write a perfect script for South Africa then it will be to beat New Zealand in the semi-finals in Auckland and then go on to play the final against Australia and win at Melbourne," Pollock told reporters. South Africa have never gone beyond the semi-finals of the World Cup since their readmission to international cricket in 1991. Pollock was part of the squad in 1996 when South Africa lost to the West Indies in the quarter-finals in Karachi before he took five wickets in the tied semi-final against Australia at Birmingham in 1999. Eventual winners Australia qualified for the final on account of winning the group match against South Africa. Pollock was then captain in 2003 when South Africa crashed out in the first round. South Africa were also losing semi-finalists in 2007 and went out in the quarter-finals in 2011. "For me, the top four teams will be Australia, South Africa, New Zealand and India," said Pollock. "I think New Zealand have done well and if it goes as per the plans then it will be a South Africa v New Zealand semi-final in Auckland," said Pollock of the second semi-final. Pollock said South Africa, who play Pakistan on Saturday in Auckland, are in great form. "Five of the top six South African batsmen have scored hundreds so far and the sublime form of AB de Villiers gives them the edge," said Pollock. "They had a low key game against Zimbabwe and then it was a wake-up call against India but since then they have been wonderful," said Pollock of South Africa's three wins in four games. Pollock praised captain De Villiers who smashed 166 in 62 balls in the crushing victory over West Indies. "Just watch his performances and how destructive he can be," said Pollock. "He is the No 1 ranked batsman. Chris Gayle is very destructive, but De Villiers is destructive 360 degrees. "Look over the last two months the performances he has put in - to score a 31-ball hundred was awesome," added Pollock of De Villiers's fastest one-day hundred against the West Indies in January.